In an effort to continue to grow the Glenville Oktoberfest event, the planning committee has been working with the Wolf Hollow Brewing Company (WHBC) and is thrilled to announce that a larger (second) Biergarten tent has been added to the event. 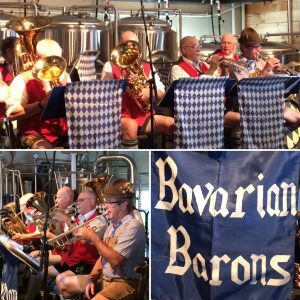 This large 40′ by 80′ tent will hold over 200 folks that can enjoy the sounds of the Bavarian Barons as they take the stage around 4:30pm on Saturday! The Barons recently visited the WHBC brewery for their kickoff for the Fall Tree Oktoberfest beer! Come join the fun at Glenville Oktoberfest held this Saturday from 12-9pm at the Town of Glenville’s Maalwyck Park along the banks of the Mohawk River!